24-hour forecast: Cloudy at times today with a few showers and isolated thunderstorms mainly over the north this morning, with showers becoming isolated this afternoon. Tonight a few showers or thunderstorms will affect mainly southers districts. Winds: East to southeast at 10-20 knots. Today: Winds: E-SE 10-20 kts. Seas: Choppy - moderate. Waves: 3-5 ft. A few showers and isolated thunderstorms mainly north , decreasing. Tomorrow: Winds: East 5-15 kts. Seas: Choppy. Waves: 2-4 ft. A few showers or thunderstorms. Marine Outlook: Winds: East 5-15 kts. Seas: Choppy. Waves: 2-4 ft. Increasing showers or thunderstorms. General Outlook: (Sat & Sat night) A few showers or thunderstorms over most areas on saturday, with showers increasing over the coast saturday night as an active tropical wave approaches. Tropical Weather Outlook: Hurricane Cristobal is centered near 42.1°N latitude, 51.7°W longitude or about 325 miles SSE of Cape Race Newfoundland. Cristobal is moving to the NE at 49 mph with maximum sustained winds of 80 mph. The Belize Tourism Board announced today that the Village Arts and Craft Expo that was scheduled for this weekend has been postponed until November first due to the inclement weather that is forecasted for the weekend. According to Forecaster, Michael Gentle, of the National Meteorological Service, since this morning, the country has been experiencing a tropical wave that is currently making its way over the country. But there is some additional bad news because while weather conditions will improve by Friday, a subsequent wave will affect the country on Saturday. Gentle explained the system in the Caribbean, saying that despite the expected downpour, further development of the wave is not likely. We’ll have more on this in the weather report. Radar stuck again last night with large amounts of rain coming in from the ESE, mainly effecting Toledo. There is a lot of angry ITCZ activity going on out there. . . .That very small local area near Texas has now grown to cover most of the north Gulf, but moving northwards now. . . ..There is possibly another TS developing in the eastern Caribbean, probably will go northwards. . . . . There is a large area of disturbed weather in the central Caribbean, which keeps changing its pattern and it is moving our way. . .. .That will quite possibly effect Belize weather over the next 2 - 4 days, bringing patches and periods of significant Rain and localized strong Winds and squalls. . . . Wind direction is these squalls can change direction very abruptly.. .. Probably not an ideal condition for sailing, but could prove very interesting and challenging. I don't know about the far south, but we got no rain near Big Creek yesterday or last night. Saw some mild distant lightening, but no rain. None for us for a couple of weeks now. There has been so little to report from the Cayes of Belize other than a hot and dry summer. I just noticed on a weather site that although the temperature in San Pedro is only 87F, it "feels like" 102F. Great excuse for getting in the hammock in the shade with a tall glass of ice tea. 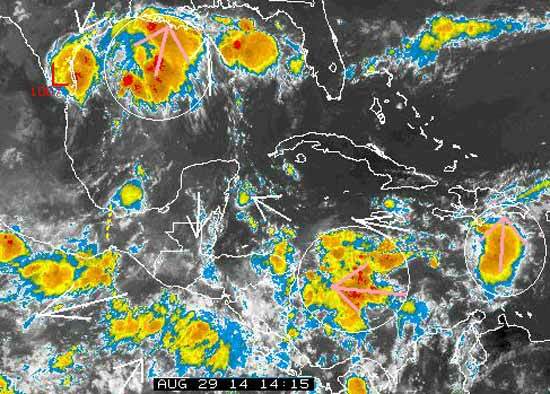 Looking forward to the rains we anticipate from the tropical wave that should cross our shores Sunday. Over the past week or two we have had a remarkable amount of saragasum float up to the shore. With the seas calm, the water and sun being very hot, the stuff is virtually cooking in the shallows. Looking forward to the September Celebrations, Carnival and all the parades and parties that go along with the season.